As the first day of Love Saves The Day drew to a close I headed over to the CRACK stage to watch seasoned electronic producer Four Tet. Real name Kieran Hebden, Four Tet has been releasing solo material since 1998’s ‘Thirtysixtwentyfive’ making him a veteran within the world of electronic music. His latest album ‘New Energy’ was released last year to great critical acclaim, it’s a transcendentally brilliant mix of soul shuddering, atmospheric drums and angelic, moody synths; undoubtedly one of the best albums of 2017. The CRACK stage is a dark, low ceilinged tent. Upon entering ones feel as if one is in a small basement somewhere in the city centre rather than in the middle of Eastville park. The tent is packed with a dark mass of people, their faces lost to the dark lighting and smoke-filled air. This strange, otherworldly environment is the perfect setting for Hebden’s music. As he begins to play, Four Tet is nearly invisible in this intimate and dark stage under the low canvas roof. His music is absorbing, combined with atmosphere of the stage the performance is a multisensory, immersive experience. His songs all blend into one another, a vast, beautiful hour of music. When the plucked melody of ‘Two Thousand And Seventeen’ breaks through the deep, murky bass it’s like coming up for air, and the groovy ‘SW9 9SL’ (the postcode of the Brixton O2 Academy) gets the whole room moving. Though not as lively as fellow Saturday headliner Fatboy Slim, Four Tet’s set was the perfect end to the day. Gently danceable yet therapeutically soft the combination of atmosphere and music was a one of a kind musical experience. Truly once in a lifetime this set was without a doubt the highlight of the weekend. 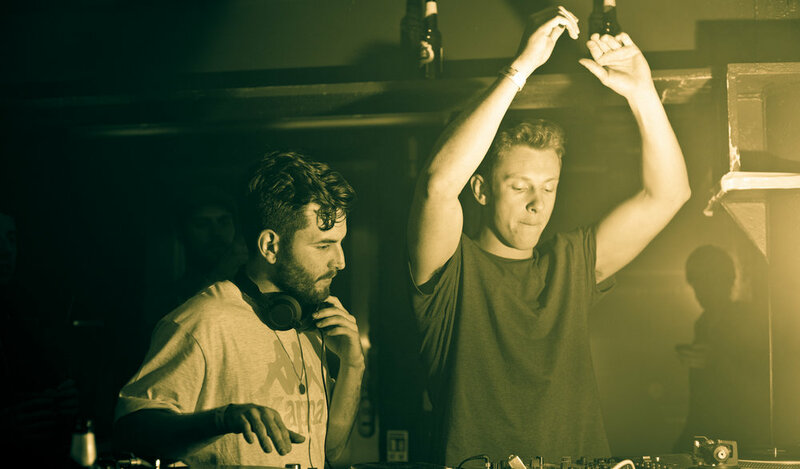 Bicep are a big name in the world of dance music. Having established themselves as highly knowledgeable dance connouseurs with their blog ‘Feel My Bicep’ the Northern Irish duo took to producing several years ago. Now, with a brilliantly diverse back catalogue under their belts - including last year’s eponymous debut LP - Bicep are touring the world with their live set. A live performance rather than simply a DJ set, Bicep have performed at many of the worlds dance music meccas including Dekmantel, Berghain and, of course, Motion. They draw a huge crowd for their mainstage set on Saturday at Love Saves The Day 2018. Even 20 minutes before the pair are due to start their set the mainstage is arena is full all the way to the towering, fairy light clad helter skelter at the back of the field. Space is tight but the rammed crowd finds a way to dance when the music begins. Facing each other onstage with a mass of electronic musical equipment between them Andy Ferguson and Matt McBriar create an incredible, hour-long wall of techno and house. Fan favourite ‘Just’ is gradually introduced with the earworm of a melody fading in and out of the highly danceable beat. Orca, Vale, Opal and many more are all seamlessly blended into one another but with ten minutes left of the set the music slowly fades out to silence. The only sound is applause, murmured conversation and then, slowly, building out of nowhere the introductory phrases of a sparse, extended reinterpretation of ‘Glue’. As the rhythm comes in the atmosphere in the crowd is euphoric, the energy is high and doesn’t die down until the final kick drum faded out. Bicep’s live show is not one to be missed, far more than simply a DJ set it’s a fantastic presentation of electronic music, taking it beyond the realm of what most producers deliver when performing. Their show is not one to be missed.